The kitchen is a unique portion of the house that requires specialised attention. It is why it costs more to furnish a kitchen than any other room. One of the critical areas to consider is the countertop. It is here that most of the activities in the kitchen take place. Also, the countertop sets the tone of the kitchen’s style. Granite, marble, quartz, glass, ceramic and wood are all viable options for the kitchen worktop. While each has a unique benefit, solid wood is the best option for kitchen worktops in general. 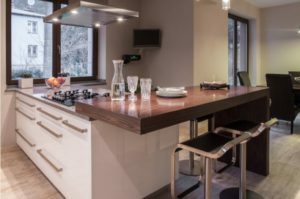 Below are five benefits of a wooden worktop. Texture, look, and elegance are the first considerations when thinking of a kitchen countertop. Worktops made of granite provide a luxurious, modern ambience to the kitchen. Unfortunately, the stone almost always ends up as the centrepiece of the kitchen and everything else has to match its presence. It becomes a problem when your taste changes and you need to introduce a different colour theme to the kitchen. Solid wood kitchen tops, on the other hand, are stylish and come with all colours and textures. It is why most people who opt for laminate kitchen worktops mimic solid wood. Solid wood from leading timber merchants such as by Theo’s Timber Ltd is strong and durable. Dropping a pan, glass or marble on granite will crack it, but solid wood might only be dented. The dents can be sanded, refilled and sealed for a polished new look. Repairing a cracked stone worktop is not only strenuous but also costly. Dropping a pan on a stone surface will produce more noise than on a wooden surface. The reason is that wood is softer and less dense than granite or marble. It is a perfect solution for people who love quiet working areas. One significant limitation of marble is its high porosity, which makes it a breeding ground for bacteria. Unfortunately, it cannot be sealed, unlike granite and laminate kitchen worktops. However, wood surpasses them all with its natural anti-bacterial properties. Hence, you do not have to scrub intensely to keep the wooden surface bacteria free. Unlike all the other materials, wood ages graciously. Its colour deepens with time, making the surface shiny. It is unlike other materials that weaken and develop tough stains after prolonged use. Despite being simple and less extravagant, wood is a suitable option for those who love to try different styles in their kitchen. It is also durable and can outlive every other item in the kitchen even with minimum maintenance. Open your kitchen to different tastes and styles by installing a solid wood countertop.